OSCE mediators urge an end to attacks after a month in which the 20-year-old ceasefire was broken in thousands of incidents. A relic of a war that isn't really over. Demotix / Onnik Krikorian. All rights reserved. 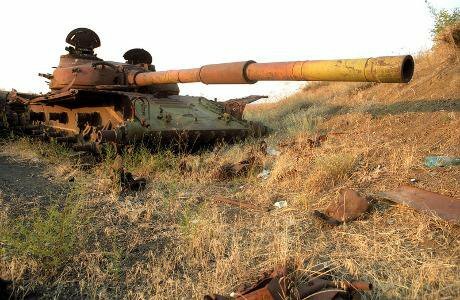 IWPR: As an upsurge in fighting between Azerbaijani and Armenian troops is accompanied by increasingly tough rhetoric, the ceasefire that has held for two decades is under more strain than ever. The competing accounts of what is going on along the border and the ‘line of contact’ around Nagorno-Karabakh are hard to reconcile, but adding up all the reports of ceasefire violations gives around 5,000 for January—the biggest monthly figure since active hostilities ended in a truce in 1994. Giragosian was speaking at a discussion meeting held by the Institute for War and Peace Reporting and the Media Centre in Yerevan late last month to examine the implications of the upsurge in fighting over the former predominantly-Armenian enclave of Azerbaijan. Worryingly, officials on both sides are using the word ‘war’ to describe what is happening. In remarks quoted by the Armenian service of RFE/RL on 6 February, an Armenian Defence Ministry representative referred to “a slow war on the border”, while his Azerbaijani equivalent responded by saying that “in actual fact, the war has not halted in the last 20 years”. War would end when Armenian forces withdrew from Azerbaijani territory, he said. The Minsk Group—the mediating body of the Organisation for Security and Co-operation in Europe (OSCE) on the Karabakh conflict, chaired by the United States, Russia and France—has issued several expressions of concern. In a statement on 7 February, the group’s co-chairs and the current OSCE chair, Ivica Dačić, said: “We all agree that the military situation along the line of contact and Armenia-Azerbaijan border is deteriorating, posing a threat to regional stability and endangering the lives of civilians ... After 2014, in which approximately 60 people lost their lives, we are alarmed that this disturbing violent trend has continued.” The statement called on all sides to “end incursions, cease targeting villages and civilians, stop the threat of reprisals and the use of asymmetric force, and take additional steps to reduce tensions and strengthen the ceasefire”. Defence officials in Yerevan and the Karabkh capital, Stepanakert, recorded ten deaths of Armenian military personnel in January. Azerbaijan said it had lost four men, although the number is likely to be higher. Again, these fatalities are out of the ordinary—in recent times comparable only with a burst of violence in July and August last year, when more than 20 Azerbaijani and Armenian soldiers were killed. Worryingly, officials on both sides are using the word ‘war’ to describe what is happening. The summer skirmishing receded when the presidents of Armenia and Azerbaijan were brought together by the Russian leader, Vladimir Putin, in August. Serzh Sargsyan and Ilham Aliyev met again in September and October, in what seemed to be first steps towards resuming the long-dormant peace process. One confidence-building measure they undertook was to withdraw heavy weapons from the front lines. But that optimism faded, with the downing of an Armenian helicopter in November and January’s death toll. At the start of the month, Armenia’s Defence Ministry issued new orders to officers along the frontier, authorising them to use their own initiative in retaliating against attacks and to take pre-emptive action when they saw fit. Sargsyan confirmed this apparent switch in tactics when he addressed ministry staff on 26 January, telling them that “if there are more substantial build-ups along our borders and on the front line [the Karabakh line of contact], we reserve the right to deliver pre-emptive strikes”. Azerbaijan’s Defence Ministry came out with its own statement on 12 January, insisting it would exercise its right to fly manned and unmanned aircraft over the line of contact, and to deploy “all available military equipment” without reference to the other side. On 29 January, it announced that its forces had shot down an Armenian drone plane near Karabakh. Armenian officials said this was “absurd” and suggested instead that the Azerbaijanis might have downed one of their own aircraft. Speaking a day after Sargsyan’s announcement, Aliyev dismissed Armenia as a mere “colony” which “cannot exist as an independent state”. He was referring to the large economic imbalance between his oil-rich state and Armenia, which affects the arms race between them. The Global Militarisation Index 2014, produced by the Bonn International Centre for Conversion, ranks Armenia and Azerbaijan among the world’s ten most heavily militarised states, measured by defence spending against gross domestic product and the number of armed-forces personnel per capita. The Stockholm International Peace Research Institute reports that defence spending has risen exponentially in both countries. Between 1995 and 2013, Armenia’s annual expenditure rose from $52m to $427m. But that pales in comparison with Azerbaijan, which spent $3.4 billion in 2013, as against just $66m back in 1995. Much to Armenia’s annoyance, its security and economic ally Russia has been happy to take Azerbaijan’s cash for high-tech weapons, including modern tanks and missiles. These figures do not include defence expenditure in Nagorno-Karabakh, governed by a separate Armenian administration since the war stopped in 1994, although no one has recognised its claim to independence from Azerbaijan. Giragosian sees this disparity in spending power as a risk factor, since it could result in “a shift in the balance of military power in Azerbaijan’s favour over the longer term”. Right now though, he said, it was not enough to change a situation where “Armenia’s defensive position is still stronger than Azerbaijan’s potential offensive capacity”. In the shorter term, Girogasian said, the real risk was that war could break out “by accident, based on miscalculation”. This article was originally published by the Institute for War and Peace Reporting. It is reproduced with appreciation.